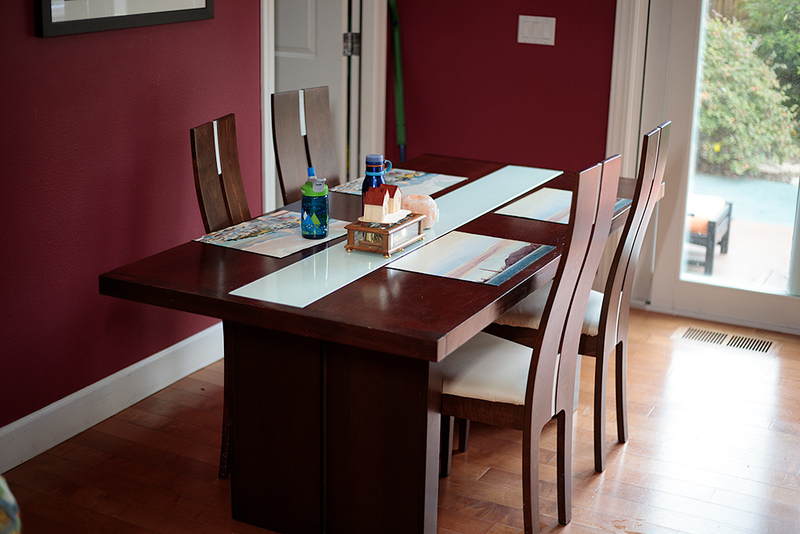 I actually refinished it three years ago - but with three cats and three kids, it was a short-lived success. 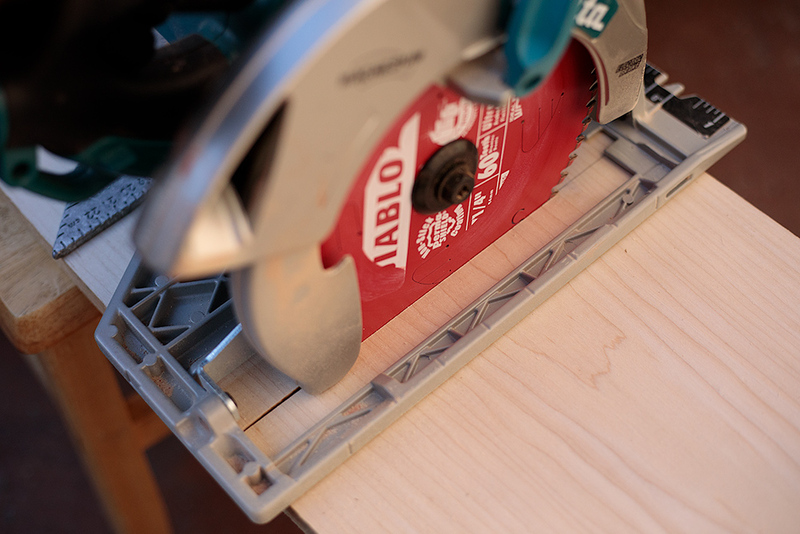 The table was a cheap veneer-on-particleboard contraption, so it probably would not have survived another sanding. In fact, the slightly darker spot in the bottom left corner is where I accidentally went through the veneer during the first refinishing. I fixed it the best I could, but it was a clear warning sign. Short of redoing the entire veneer, no amount of wood necromancy could have made the table look whole again. 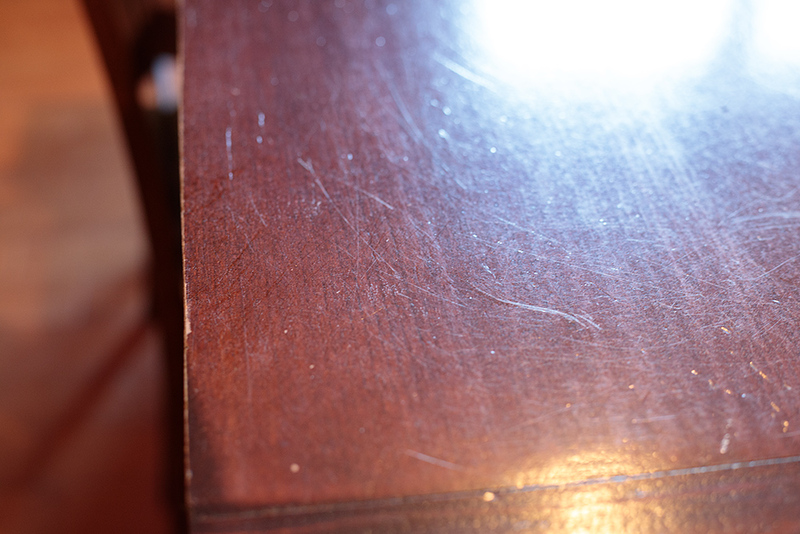 The dark finish only made things worse: the table was close to a large window and every scratch showed up as a white line. 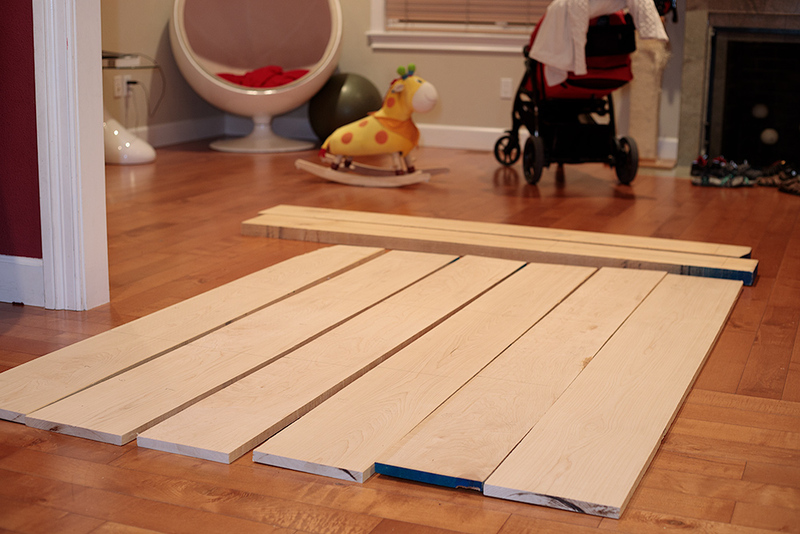 The top is going to be made out of eight rows of relatively narrow maple boards, each about 1" thick (4/4), 4" wide, and 22" long. 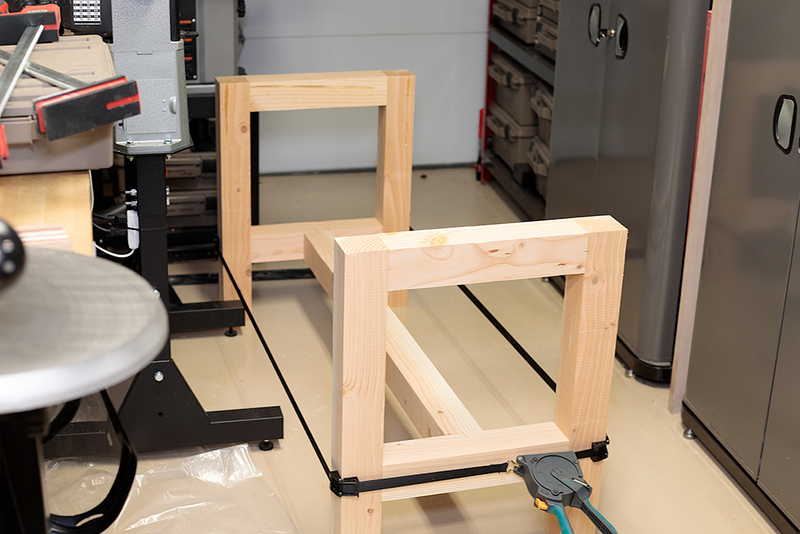 Working with small segments makes it easier to pull this off in my relatively cramped workshop - and eliminates most of the issues with warped or imperfect lumber. 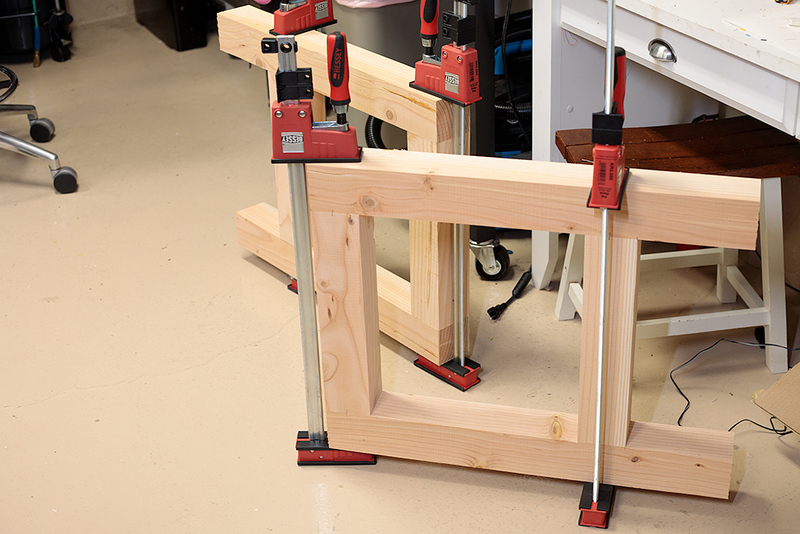 To make the top look more hefty while keeping its weight (and cost) manageable, the whole thing is going to be framed with ~2" thick (8/4), 2" wide strips running along the edges. 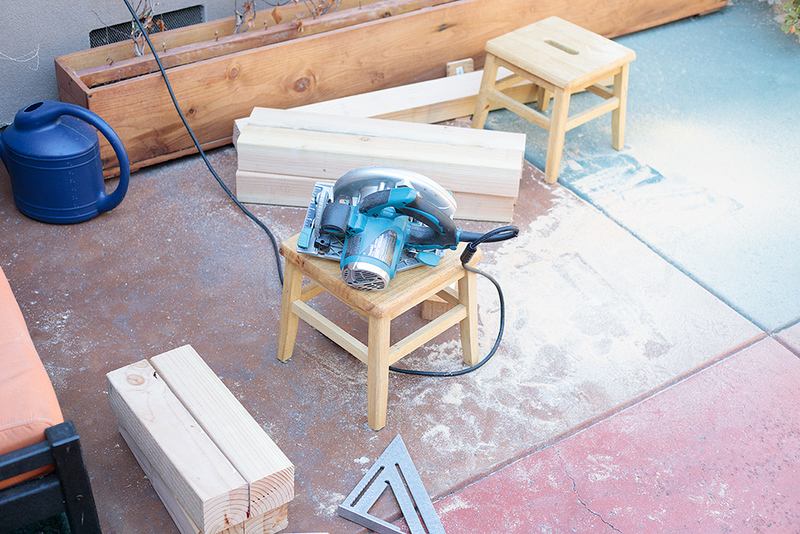 This trick also helps hide the end grain. 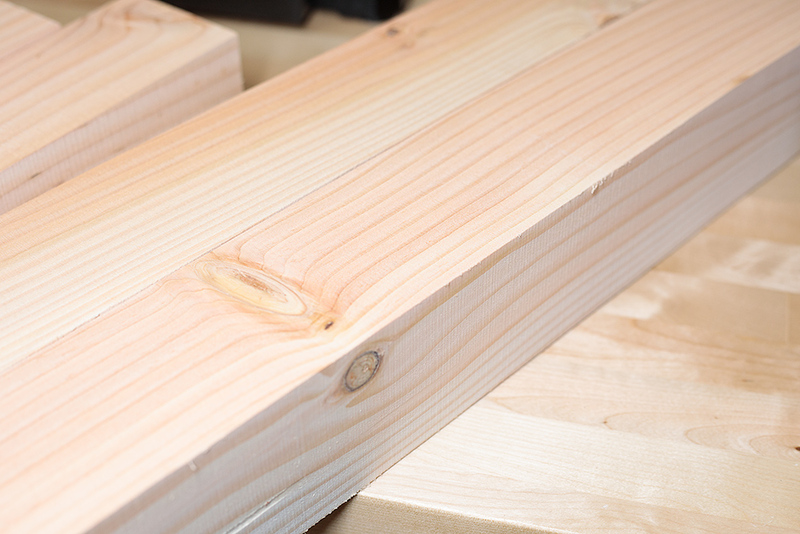 The base is supposed to be cheap 4x4 construction lumber. I want to finish the base in some dark color to provide a counterpoint to the light-colored maple on top. I think the contrast would go well with the rest of the room. 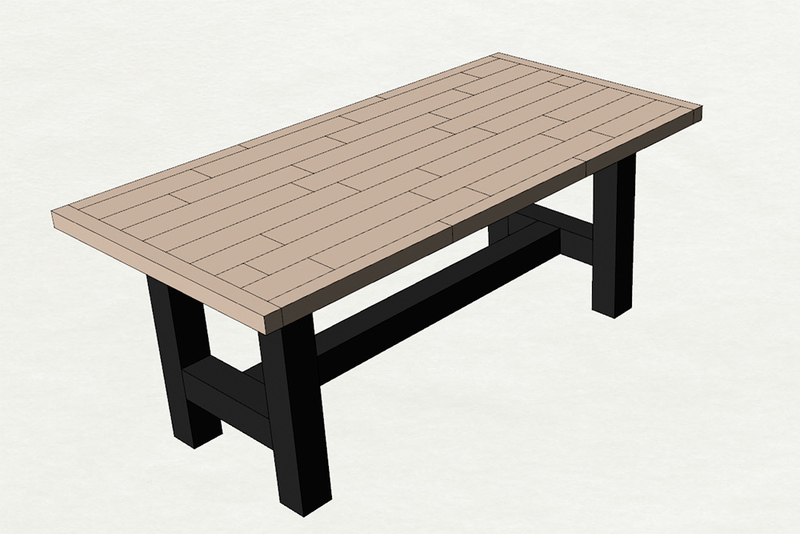 The overall size of the table will be ~6 ft by ~3 ft, basically the same as the outgoing one. The height is 29" or so. 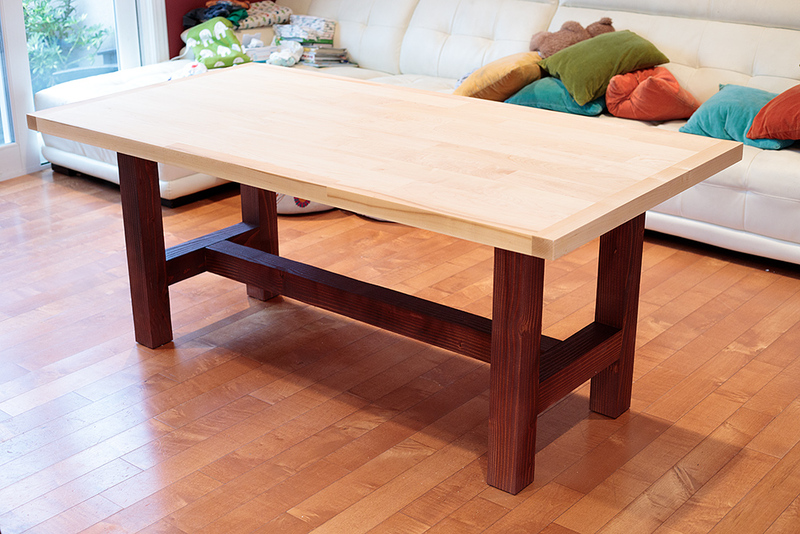 Maple seems like a pretty good choice for a dining table: it has a very light color, tends to have interesting grain patterns, is reasonably hard (about 3.5x harder than pine), and doesn't cost much. Only about three fifths of it should be needed for this project, but I figured it's better to be safe than sorry. 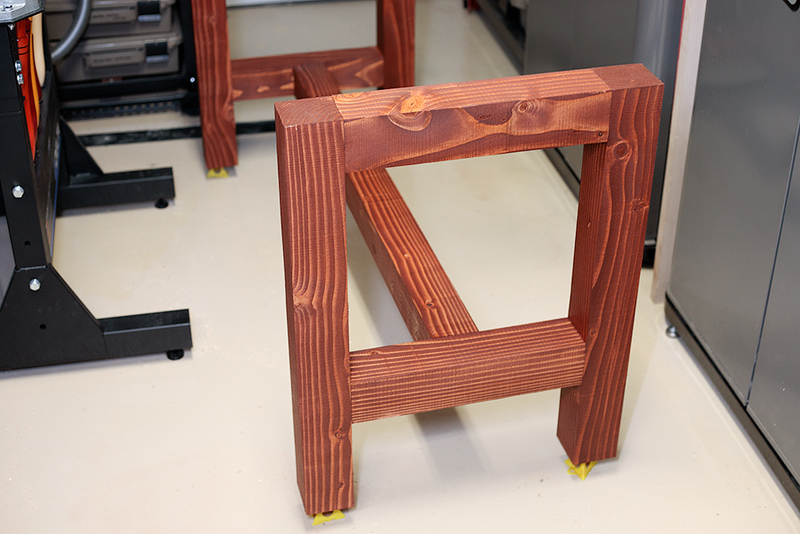 This is done with a miter gauge (yellow) to get the angles right. 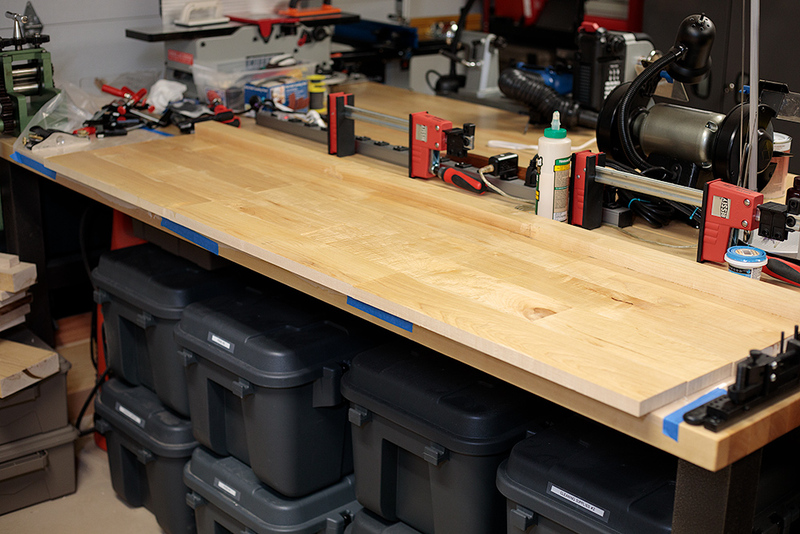 Note that the thicker edge is going to be flush with the top surface when all is said and done - but that obviously doesn't happen if I just put it all on the floor. 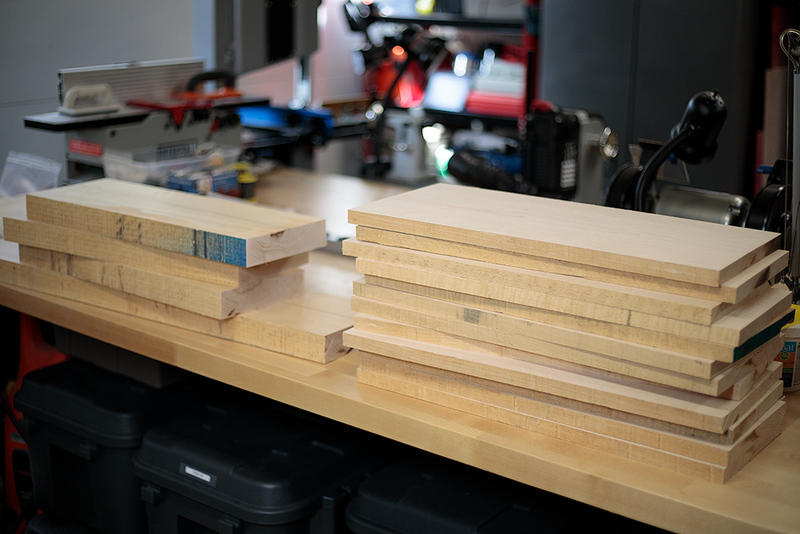 While each board was nominally 4" by 22", you can see that I cut several of them into halves, then put one half at the bottom of the row, and the other at the top. This had the effect of breaking up the pattern, so that the short edges do not line up across the rows. I think it looks better this way. 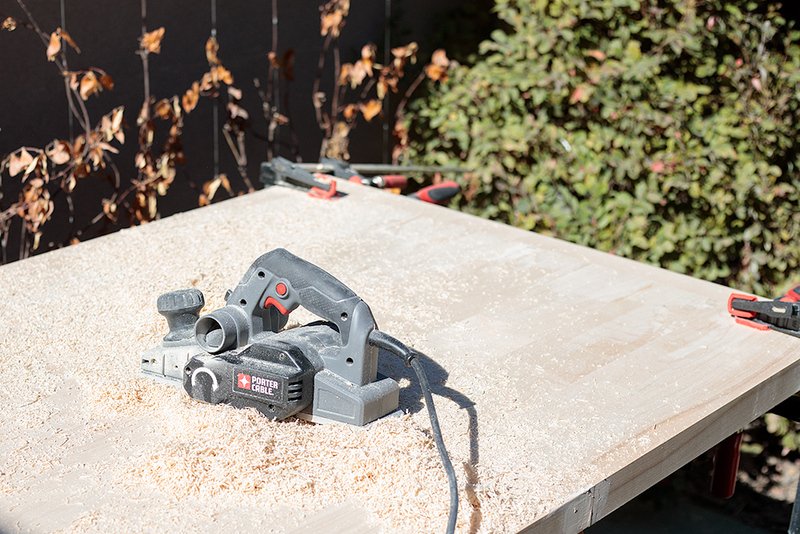 It's basically the trick that's used for most wooden floors. 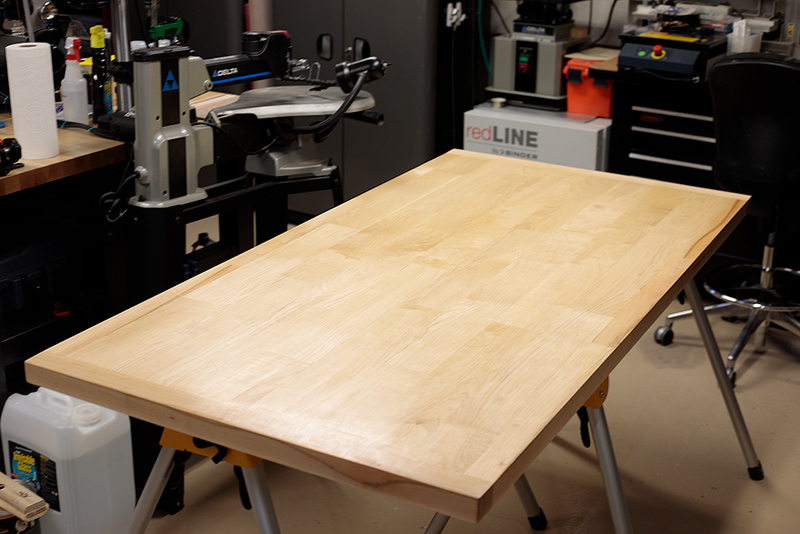 Makes the table more robust, too, because its integrity doesn't depend on the relatively weak end-grain joints. 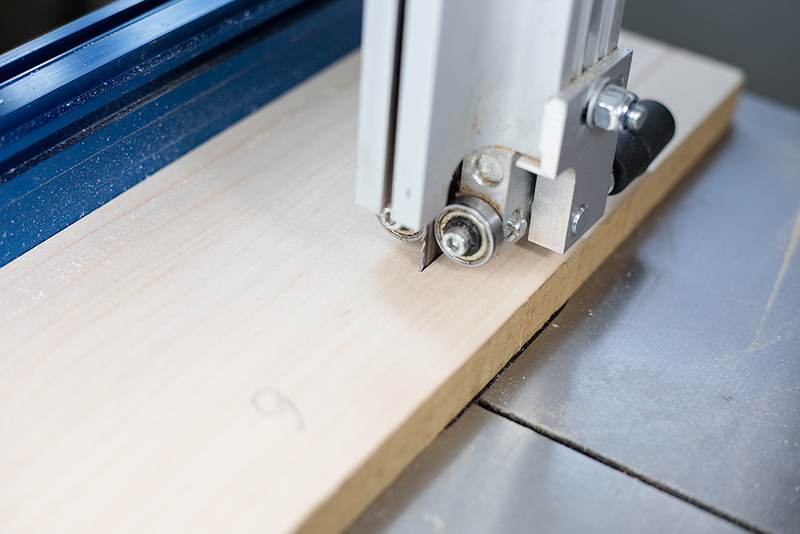 This way, the planed top surface of each board is resting against the workshop table - and then it's clamped down to be sure. 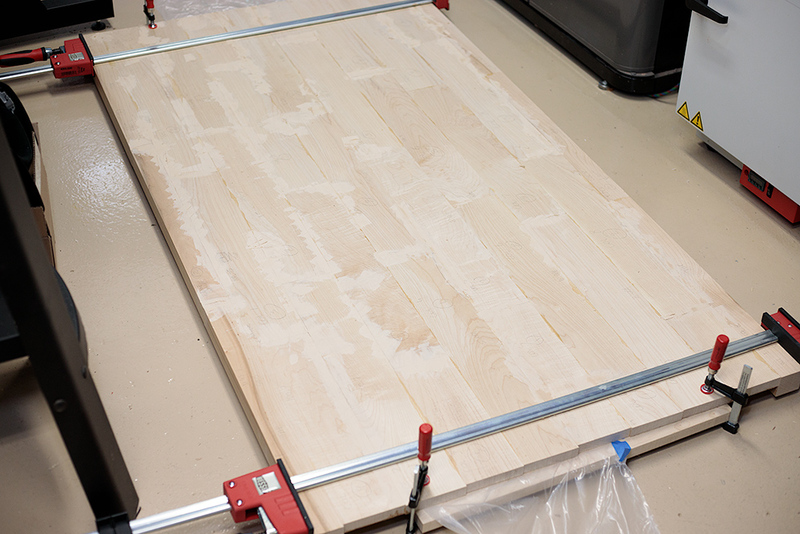 As mentioned, this mostly worked out fine, but still needed planing down the road - a biscuit joiner would allow for more perfect alignment, but I don't have one... yet? This is the underside, so I am not going to put any effort into finishing it, but I'm putting a coat of shellac to prevent warping due to humidity variations. 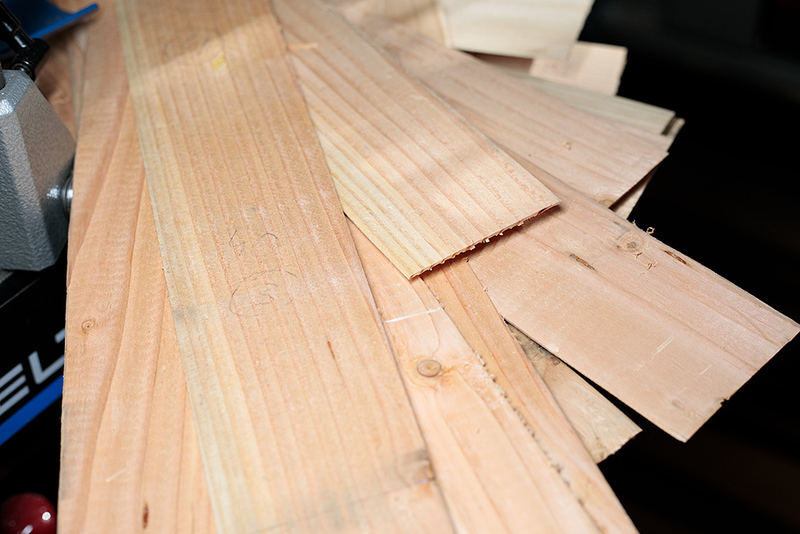 Otherwise, the unfinished side would expand and shrink more than the finished top. Not a huge concern for indoor furniture in California, but hey - no harm. And now, for the moment of truth... the first half of the table flipped over. 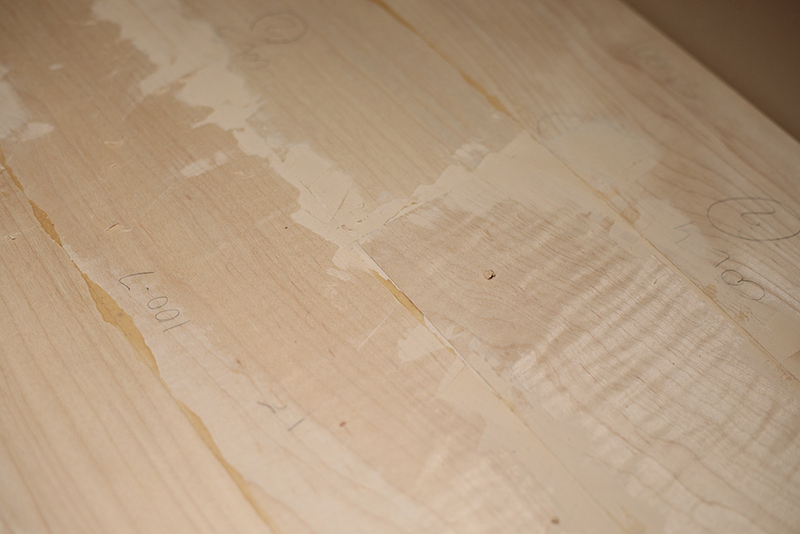 Thankfully, nothing seems out of whack; some of the boards were 1/64" or so out of level, but that's not hard to plane down. There weren't any major gaps, although I spread a good amount of latex wood putty anywhere I could see a hairline gap or any other nicks. Better safe than sorry. 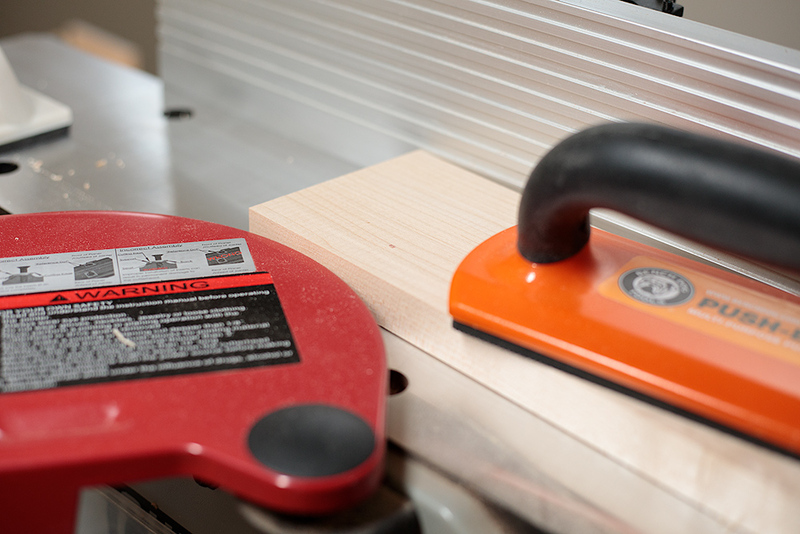 Both pieces lined up pretty much perfectly and needed just a gentle touch with a hand plane. 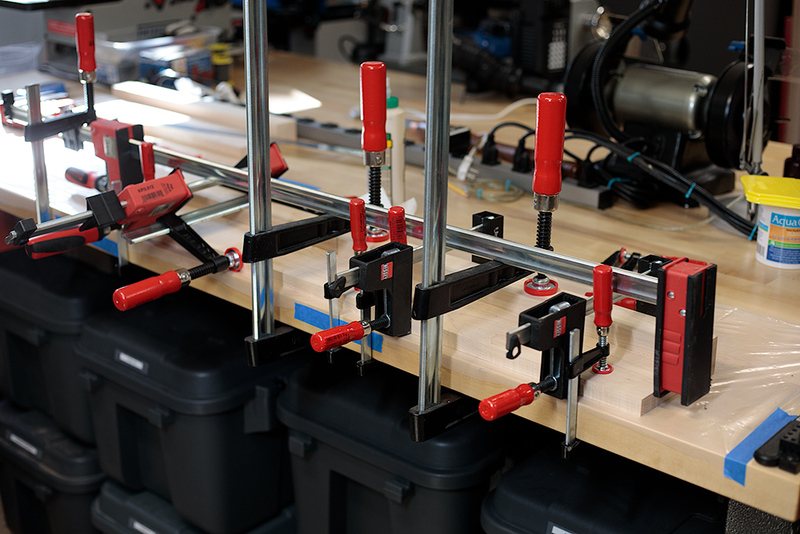 That was a blessing because I only have two 50" clamps - not nearly enough to overcome any serious misalignment. 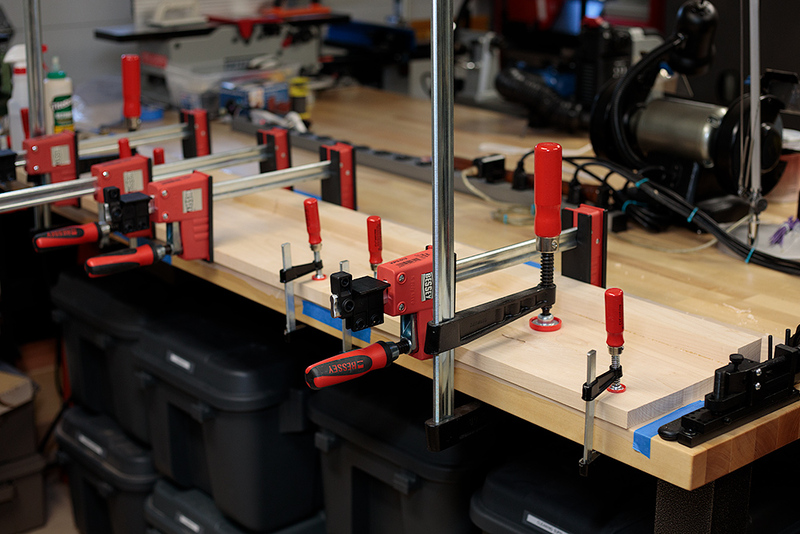 As can be seen, I'm using several smaller clamps and some scrap lumber to prevent the thin joint from bowing up when clamped, too. The breadboard stuff is something that I really should have tested before applying glue, it worked a lot better in my head than in reality - it was difficult to align it just right. 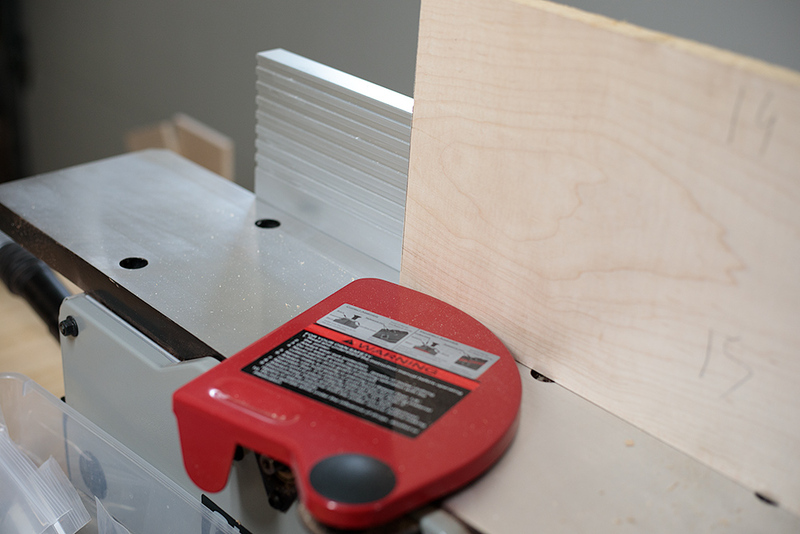 Again, a biscuit joiner or some other mortise-and-tenon approach would have made things simpler. 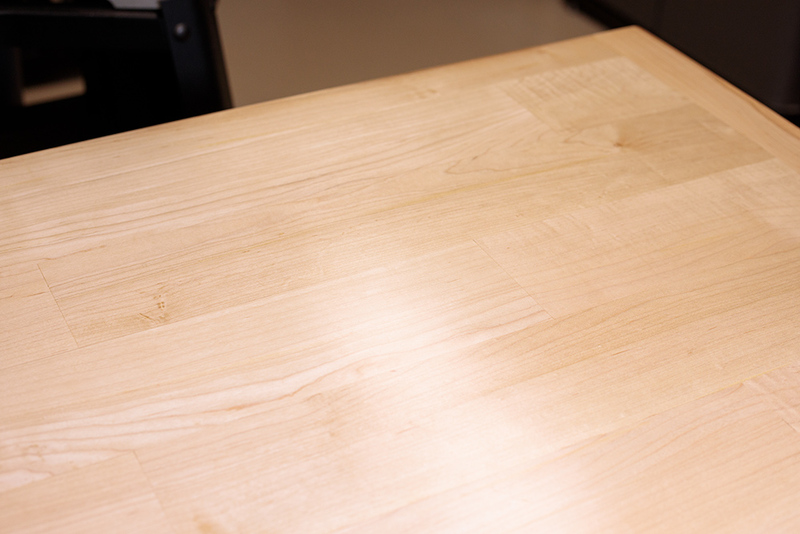 As an aside, breadboards are a tricky topic, because when humidity changes, they can expand and contract at a different rate than the rest of the table. There is some mildly conflicting advice on how to handle this; some authors suggest free-floating breadboards, which have the drawback of possibly looking unsightly when they get out of alignment with the rest of the table. 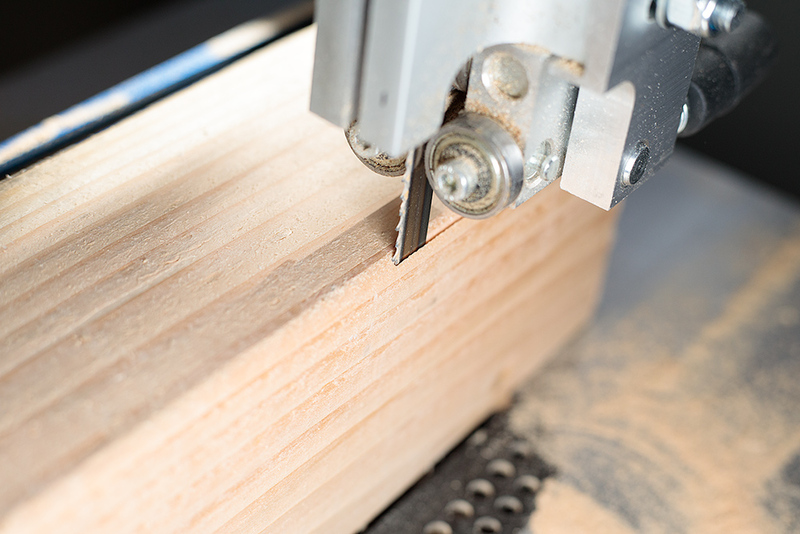 A smaller proportion of authors goes for a ton of dowels and hopes for the best (the risk here being that the table, if prevented from moving, may develop cracks). In this case, given that the indoor climate in Northern California is extremely boring (basically 70° F and 60% RH all year), I'm gonna hope for the best. It might end up being a humbling lesson, though. About ten more layers to go. I'm using wipe-on gel poly, since it's a lot less demanding than brush-on formulations - basically impossible to mess up, no drips, no dust specks, no fish eyes, doesn't require sanding between coats, etc. 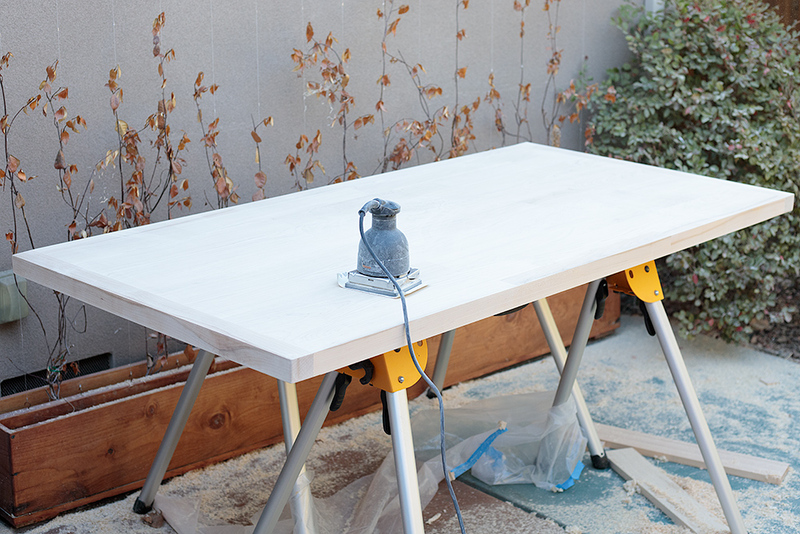 The trade-off is having to do more layers, especially for high-wear surfaces. Well, the hard part of the project seems to be done! 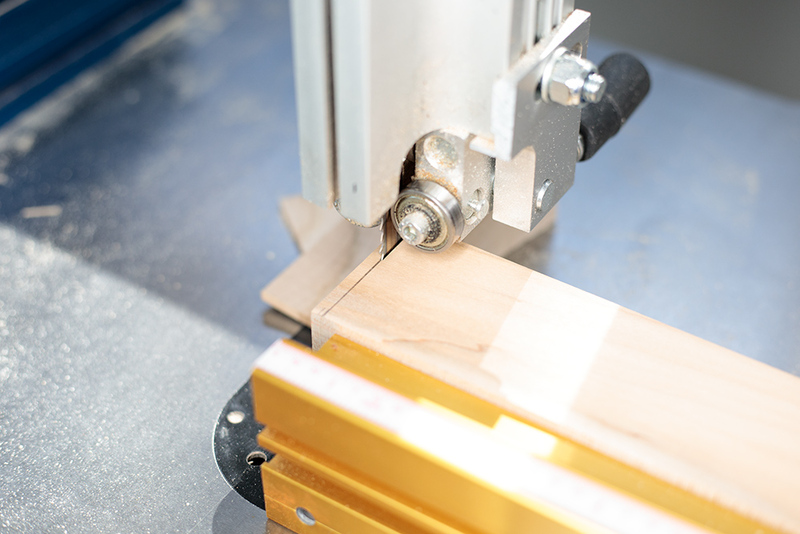 This is a small saw, so it can't really tackle a 4x4 in a single pass - I have to make multiple aligned cuts while rotating the lumber. 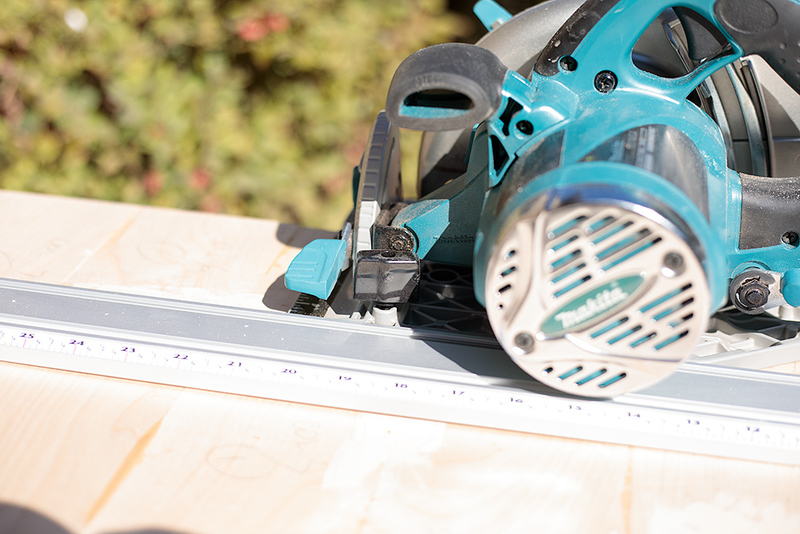 I had a larger miter saw some time ago, but ended up selling it because it was just collecting dust... I'm not smart. Since the legs are pretty hefty, this is more for appearance than stability. 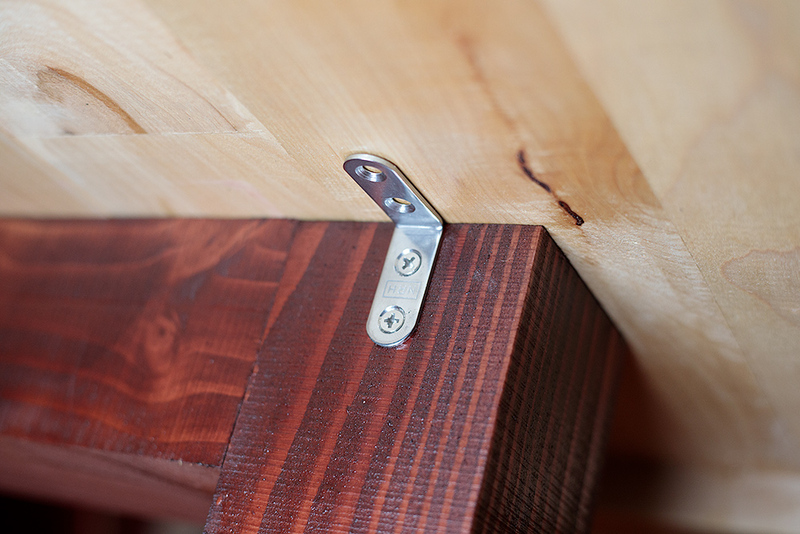 I plan to attach the top with some steel angle brackets, so the whole thing should be pretty hard to wreck. I was sort of unsure about the finish. 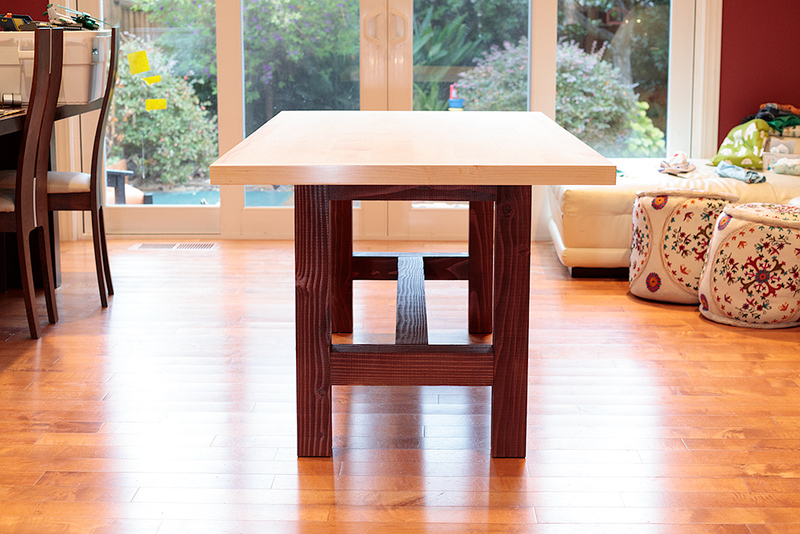 I wanted the bottom to be dark to provide contrast for the maple top and to better match the chairs and the walls. 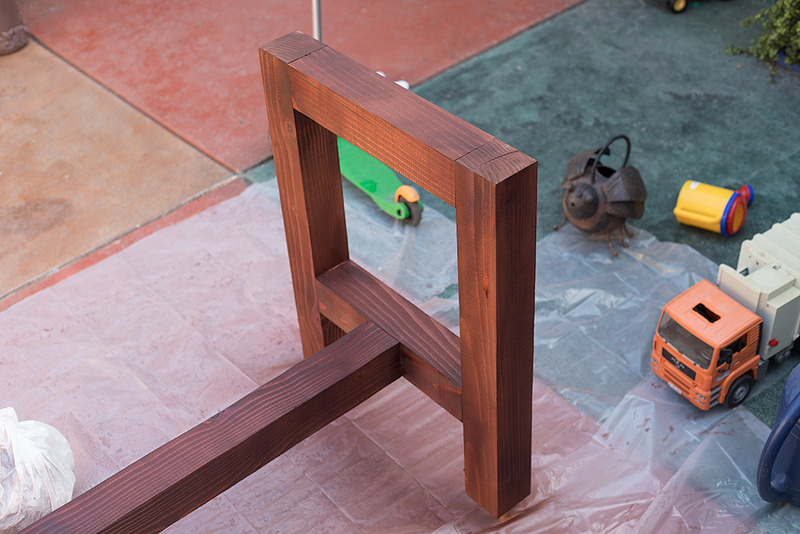 But I was torn between opaque paint (dark gray or black) and staining the base to preserve the look of wood. The risk here is that fir doesn't take stains particularly gracefully, so this could end up being a blotchy mess... oh well, I can always paint later, right? 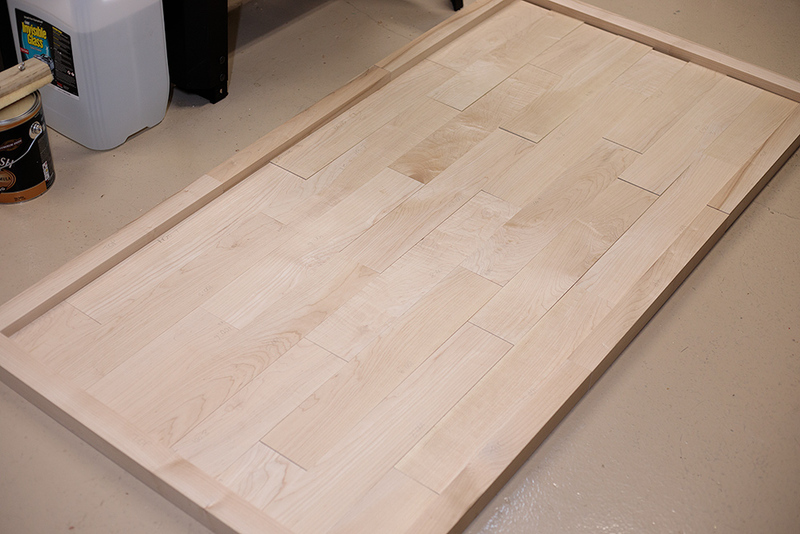 Several more coats of satin clear poly, some felt pads on the bottom, and I think I'm done with the base. 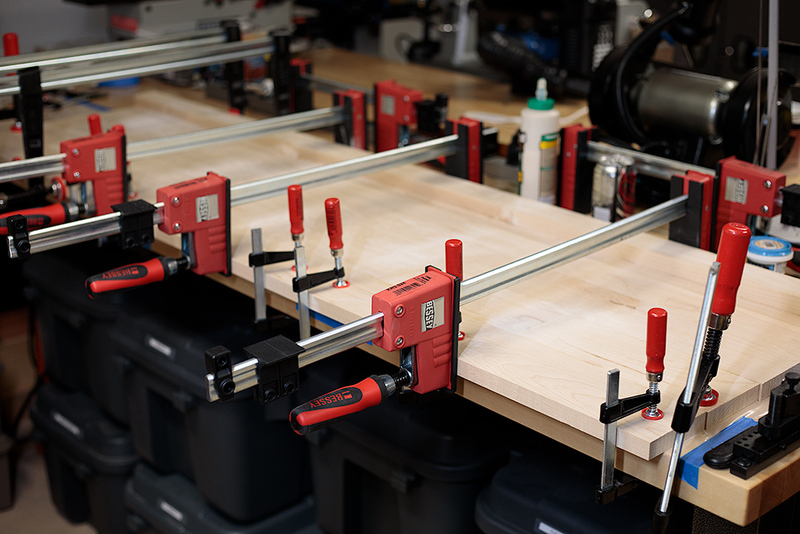 The brackets don't allow for a whole lot of movement, but given the simple design of the base with a fair amount of give, I don't expect this to become a big deal. In any case, not hard to monitor and revisit later on. Turned out pretty good, I think! The total cost of materials is about $250. Took about 15 hours of work, give or take. Well, that's all folks! If you have any questions, feedback, or critiques, you can reach me at lcamtuf@coredump.cx.